English is the dominant language of international business relations, and a good working knowledge of the language is essential for today’s legal or business professional. 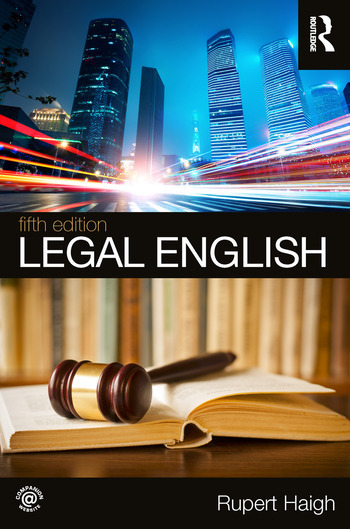 Legal English provides a highly practical approach to the use of English in commercial legal contexts, and covers crucial law terminology and legal concepts. Written with the needs of both students and practitioners in mind, this book is particularly suitable for readers whose first language is not English but need to use English on a regular basis in legal contexts. The book covers both written and oral legal communication in typical legal situations in a straightforward manner. As well as including chapters on grammar and punctuation for legal writing, the book features sections on contract-drafting, language for negotiation, meetings and telephone conversations. This edition contains additional troubleshooting tips for legal writing, guidance on good style, and new sections on writing law essays and applying for legal positions. Rupert Haigh graduated from Cambridge University in 1992 and qualified as a solicitor of the Supreme Court of England and Wales in 1997. He also holds an LLM in Public International Law from Helsinki University and a TEFL (Teaching English as a Foreign Language) certificate. After completing his legal training, Rupert worked for several years as a practising solicitor in England, specialising mainly in litigation work, before moving to Finland in 2000 since when he has been continuously involved in training legal professionals in Finland and across Europe.